While we’re not CEATEC, a Japanese technology show, news has come via PC Watch regarding a new publicly announced milestone in monitor production. For any journalist that has attended either IFA, Computex, CES or MWC over the past year, it would be hard going to miss one of the super large (80-inch plus) 8K monitors doing the rounds. 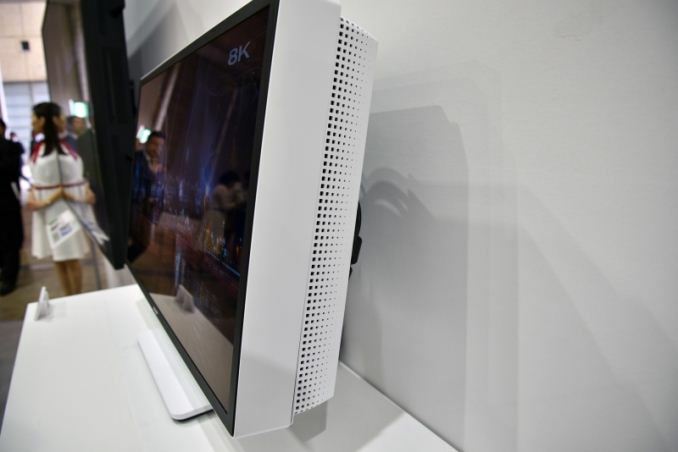 While highly impressive in their own right, current 8K displays on show typically have a low pixel-per-inch value in order to achieve a good panel off the production line. So despite the fact we can get 4K panels on smartphones (Sony Xperia Z5 Premium is 4K in 5.5-inch, or 806 PPI), expanding the size at that pixel density is difficult with panel yields. Also, moving 8K down to a 'monitor size' has been hidden at the panel companies internal research divisions until now. 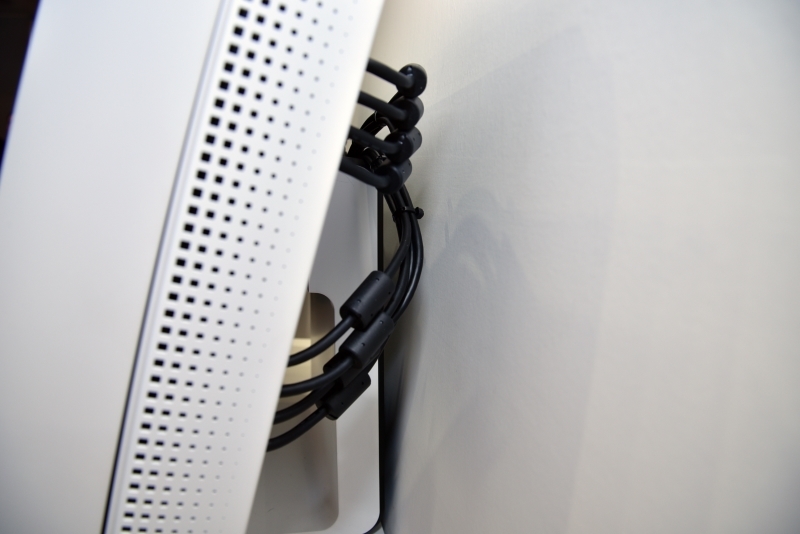 So this is where the Sharp monitor on display at CEATEC gets interesting. 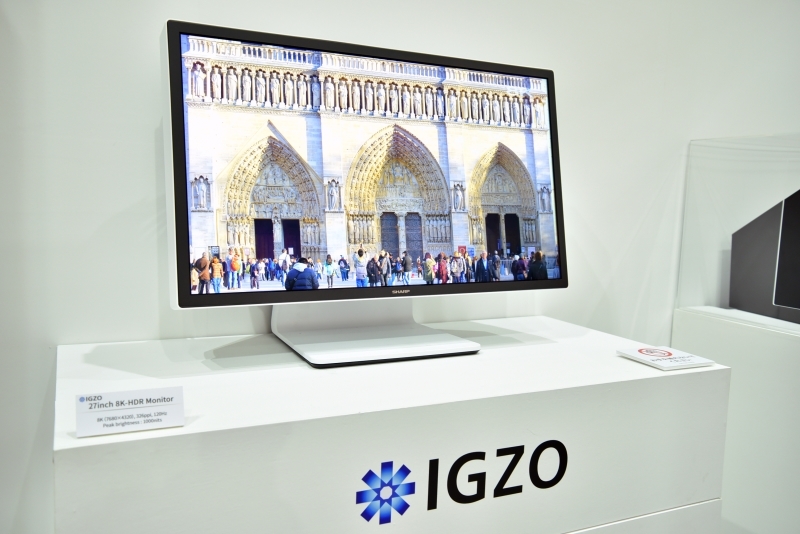 The IGZO display is down at 27-inches, marking a 326 PPI, just hitting at the door of large FHD smartphone displays. The panel is also listed at 1000 nit brightness. But to double down on specifications, the stand listed the display as supporting 120 Hz while in 8K mode, and also supporting High Dynamic Range, or HDR. This requires a large amount of data to be pumped into the display, and as a result a photograph of the rear shows eight separate DisplayPort cables being used in order to give the display the data it needs. 8K120 with HDR is no easy task, suggesting 7680x4320 at 10 bits per color channel (so 30-bit for RGB) at 120 times a second would suggest needing 120 gigabits per second of bandwidth at a minimum (or 15 GB/sec). That's even before you discuss overhead, which will push that higher. Needless to say, this is a prototype panel. Businesses with large enough checkbooks are free to try and estimate a figure for such a display, because it will be a while before a device of these specifications hits commercial availability. Also in the display was a 2.87-inch display, offering 1920x2160 resolution and rolling in at over 1000 pixels per inch (1008 PPI). This was described as ‘4K to both eyes’, affording a combined display suitable for head-mounted units or virtual reality headsets. 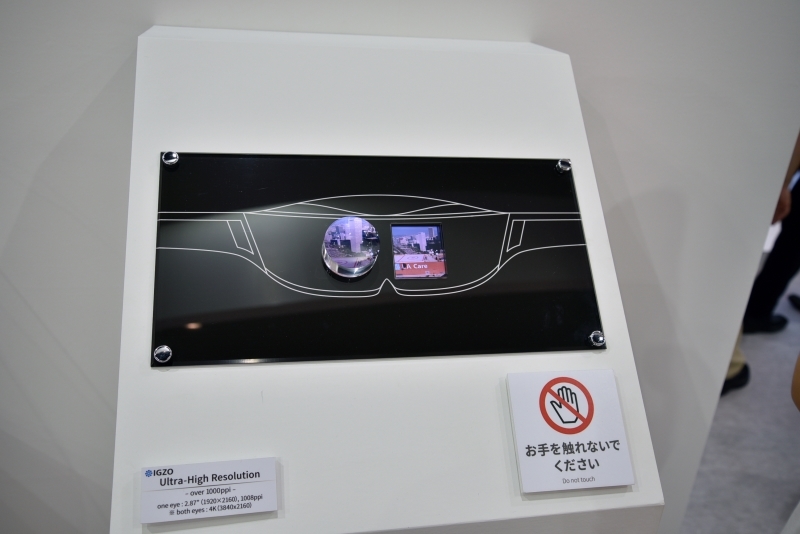 Compare this to the HTC Vive, which uses a 1200x1080 screen per eye at 3.62 inches per panel, making it 447 PPI. This gives the Sharp panel a specification of over double the amount of pixels in a given area. Of course, with that comes cost and the ability to feed that display with enough data either over cable or other means. Still, it’s an interesting prospect. 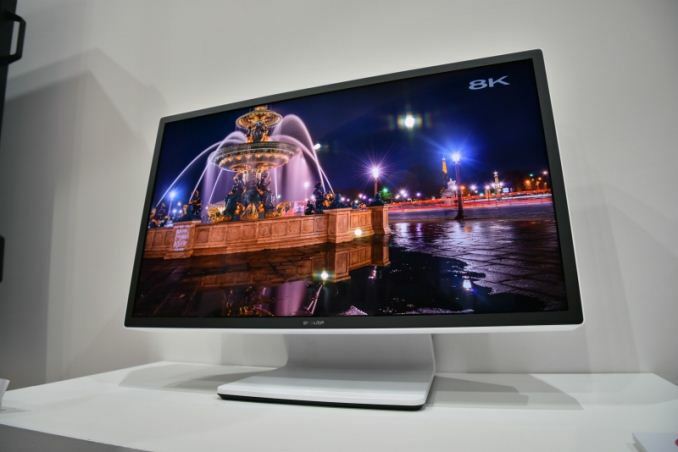 A 27 inch monitor is far too small for 8k resolution. I have a 5k HP Z27Q and at 5k the default text needs to be magnified to reduce eyestrain. 8k would only be practical for monitors over 40 inches in size in my opinion and the largest dedicated computer monitor that I am aware of is 34 inches.